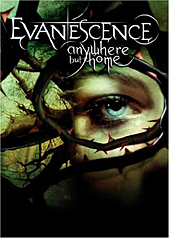 A live performance, which I believe is from the 2003 Billboard Awards, of Evanescence's "Bring Me To Life" can be found on the DVD portion of the CD/DVD "Anywhere But Home". Once you get past the Audio menu and reach the main menu, this egg can found by going down to "Behind The Scenes" selection at the bottom and clicking the left arrow button a couple times. The Evanescence E symbol will appear in yellow to the left, just click the select button, and the performance will begin.